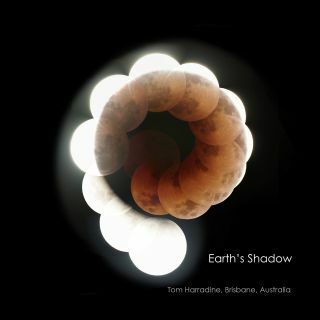 This composite image of the July 27 lunar eclipse, shot from Australia, reveals the Earth's shadow in a whole new way. If you've ever stood in the totality of a solar eclipse, you've seen something astonishing: the full width of the moon's dark shadow blocking out the sun, perfectly encircled by the dim, wispy rays of the sun's corona. And if you've also stood outside during a lunar eclipse, you might know that the effect is somewhat less dramatic. As Earth's shadow falls on the moon, it quickly swallows the smaller orbiting rock. The effect of the moon glowing bloody red with Earth's refracted twilight is beautiful, but the effect doesn't fully convey the scale of the astronomical phenomenon at work in the same in-your-face way as happens during a solar eclipse. The moon, much smaller than Earth's shadow, never shows the whole thing on its surface. Australian amateur astronomer Tom Harradine took an impressive stab at solving that problem with a composite image posted to his personal Facebook page — originally covered by Gizmodo — and shared with Live Science. By carefully arranging several different photos taken during the July 27 lunar eclipse, the longest of the 21st Century, he revealed the full scale of the Earth's shadow in space. The effect is remarkably precise; the circular shadow that emerges in Harradine's image is 2.61 times the size of the moon in the image. That's true in real life. Astute eclipse-followers might remember that the moon doesn't actually spiral through Earth's shadow in the way it appears to in this image. Instead, this eclipse was so long in part because the moon passed straight through the center of the Earth's shadow, spending a long time in the darkness after entering on one end and leaving on the other. Harradine's composite image is thus a bit of an illusion, the result of not only compositing images but also carefully rotating them to fit. Still, the effect works because, in aligning each rotated image in the sequence according to the visible curvature of Earth's shadow, the combined moons form a full Earth umbra (shadow). The visible shadow is from one straight traverse of the moon, but it's more than enough in the way of raw material to create Harradine's stunning, educational result.